In all rooms and in our lounge area you have access to free Wifi. We use „MEMON“ to neutralize and protect you from Electronic smog. The solution against electric smog. Nowdays we are more and more exposed to pollution. MEMON neutralises electric smog and optimizes the room climate, reduces fine dust in the air and renaturates the tap water in the entire hotel. In the hotel lobby you will find a computer with printer, that you can use free of charge. Our water is revitalized using the popular grander technology by Johann Grander. It tasts great, is easy to drink and has a very good quality and boosts your well-being. Three elevators transport you comfortably to your hotel room, to the reception, dining rooms, to the SPA areas, the SKY SPA and to our ski room. Order a savory cappuccino for breakfast or an aperitif before dinner. Enjoy the pleasant atmosphere by the crackling firewood, and treat yourself to peace and quiet with a good book or chat about your experiences of the day. And all of this with a wonderful view of the hotel village of Zauchensee. For relaxing and sunbathing, we created a pleasant garden with lawn at our 4 star superior hotel Salzburger Hof. You can reach our garden comfortably with direct access from the hotel. The garden is situated quiet and secluded location behind the hotel and offers the perfect place to sit down, relax and recharge your batteries in the sunshine. In the exclusive panorama lounge with a view of our hotel village you can enjoy cocktails undisturbed and in peace or spend time with your family and friends. 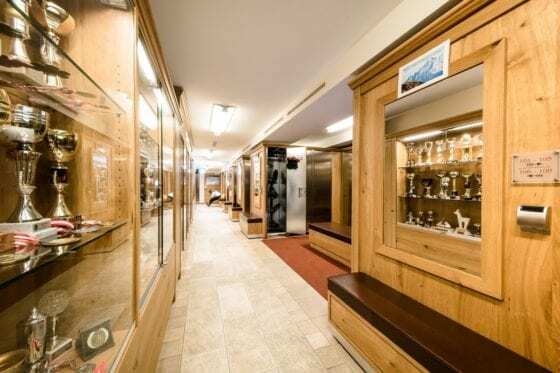 At our 4 Sterne Superior Hotel Salzburger Hof you will find a unique ski cellar with living room atmosphere and a small ski museum. Each room has it’s own heated and ventilated ski locker for skis, poles, ski boots and ski clothes. To avoid long queues at the ski lift stations, you can buy lift passes from 2-8 days directly from the hotel reception. Salzburger Hof postcards including stamps are available free of charge. You would like to arrive earlier or depature later and make use of the first or last vacation day? You are more than welcome to use your changing- and luggage room. Several newspapers can be found in our hotel bar and chimney lounge. We are more than glad to organise your preferred newspaper for you! On of your highlights during summer is our hotel convertible, which you are able to hire for a small fee including fully comprehensive insurance. Every morning you will find our morning news with information about the weather forecast, tourist attractions and SPA tips on your breakfast table. In every room a backpack is available for rental. You can take it with you when you go hiking or on excursions. We would like to offer carefree holidays for allergy suffers and their families. Allergy friendly bed linen are available upon pre-order. Each room is equiped with a balcony, a desk & vanity table, minibar, room safe, min. 1 Flat-TV with four selected SKY channels, telephone, Wifi, backpack & umbrella for rental, bathrooms with hair dryer, make-up mirror, towels for spa and pool and a cozy bath rope for adults (children bathropes upon request). Each room and suite has it’s own balcony. Crystal clear pictures and brilliant colours in an attractive size. You will find least 1 Flat-Screen in each rooms and suites. In addition you will find Sky tv channels in each room. Each rooms is equipped with a room safe, therefore you are able to store your valuables safely. Extensive gourmet breakfast buffet from 7:30 to 10:00 am. Hearty ski snack in the afternoon from 3:00 to 4:30 pm. 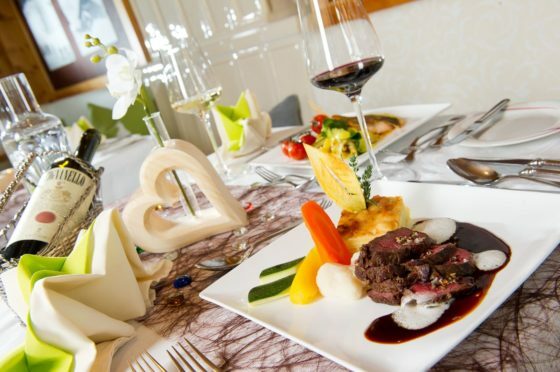 Traditional delicacies as well as a selection of various cakes. Daily fresh salad buffet with high-quality oils, homemade dressings and bread rolls. Every day a dish of the show kitchen. In our fine wine cellar, hundreds of good wines are waiting to enchant your palate. Upon request we offer our guests wine tastings. Don’t miss our “open wine cellar day”, where you are able to browse through our wine selection and find the perfect wine for your dinner. You are also able to buy wine bottles for home at the wine-house price. Alpine sauna area with big Finnish hut sauna, bio sauna, herbal steam bath, brine steam bath, infrared cabin, shower grotto, relaxation area, Grander water fountain, as well as juice bar with comfortable sitting area. You can expect a relaxing and undisturbed pool experience till 10:00pm in our indoor pool with 30 degrees water temperature and hot tub with 33 degrees. Let yourself be pampered with treatments tailored to your needs by professional hands. Relax and enjoy our SKY SPA wellness menu. You will find wellness bag with a bathrope, bath- & sauna towels and slippers for adults in your room.